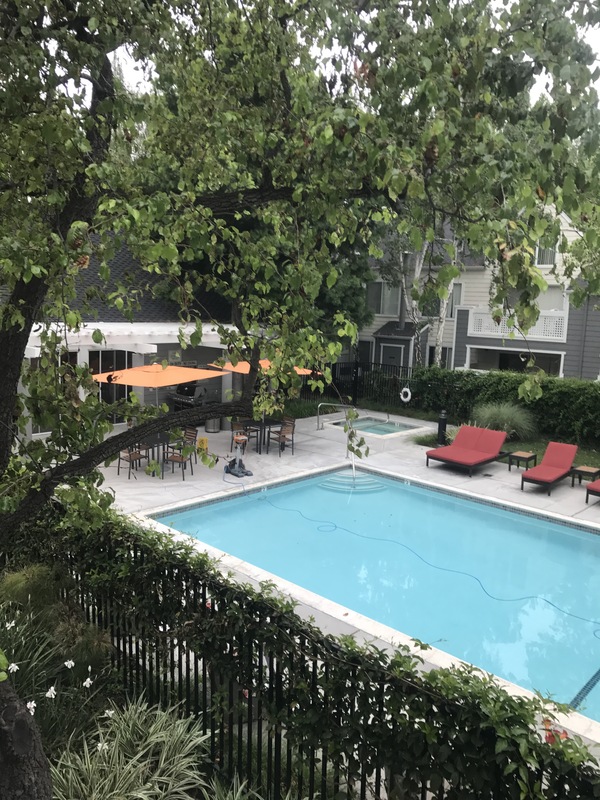 After six months of shuttling back and forth between my home in San Francisco and my temporary home away from home in Cupertino with my cousin and his family, I’d finally found (really by chance) an apartment worth moving to Santa Clara for–a cute, bright one-bedroom, framed by trees, overlooking a pool, 3 (count ’em 3!) blessed minutes from work. In one afternoon (well really a couple of hours), I’d stumble upon this gem that ticked off pretty much everything on my wish list–covered parking, a dishwasher, my own washer/dryer combo, a walk-in closet, a lovely balcony…and a bathtub! About the only thing my new home doesn’t have is a gas stove, which for a chef is a major disappointment, especially when the oven hasn’t been calibrated (ever) and the thermostat is off by 50 degrees (and barely reaches 475!) Needless to say baking a rustic loaf or even pizza has been a challenge. I’m still trying to work around the limitations of my oven (despite having it “fixed” by maintenance). 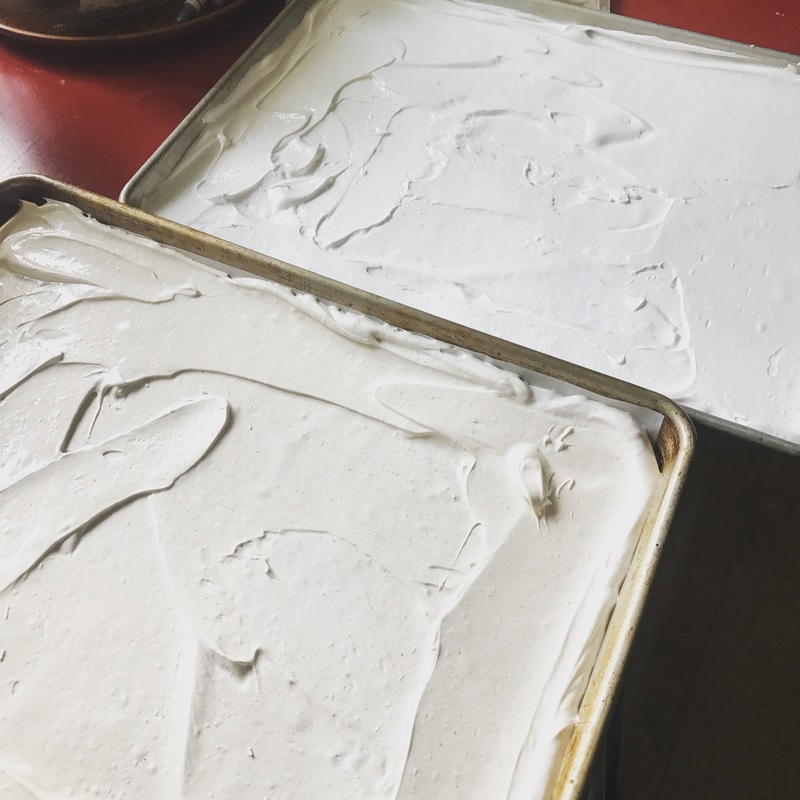 The hot summer weather, however, has pretty much curtailed a lot of my baking–yeah I’m also trying to get used to living in a warmer climate (thank heavens for AC!). Consequently, I’ve refocused my energies on DIY projects that reflect my new lifestyle and home. So, for example, when it’s 101 degrees outside and I’m craving something cool and refreshing, but don’t want to actually leave the comfort of my air-conditioned apartment, the solution is to make myself a batch of ice pops. I happened to pick up a cheap set of little ice pop molds at IKEA during one of my many trips there to procure things to furnish my new apartment (my advice: stick to the store, DO NOT ORDER ANYTHING FROM IKEA ONLINE!!) What’s great about the molds is that they are small enough to tuck into even a jam-packed freezer and the ice pops take very little time to set up. I wanted something creamy but light on the calories, so I rummaged through my frig and found a couple containers of mango and coconut Noosa yogurt–a thick Australian variety that’s similar to Greek-style only creamier in texture. I mixed in a little of my homemade lemon-ginger syrup for a touch more sweetness to balance out the tartness of the yogurt (or you can also use honey or agave syrup), then carefully spooned the concoction into the molds, layering in some fresh raspberries for color and texture. 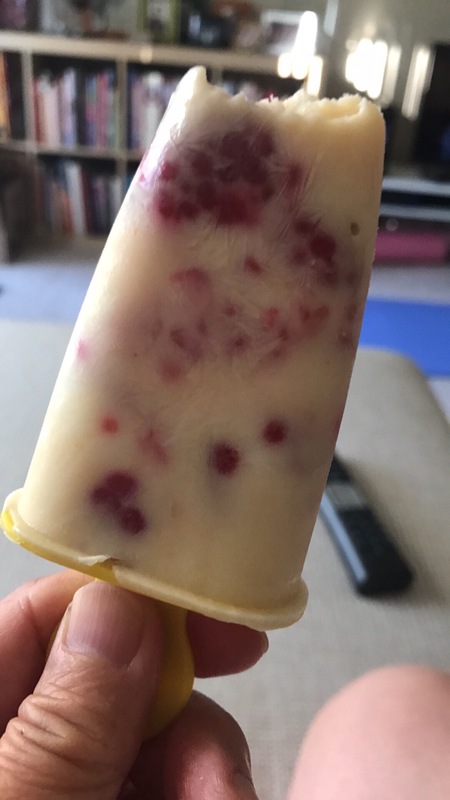 An hour later, I had some very tasty yogurt-berry ice pops! A few months back, when I was in between jobs and had some free time on my hands, I embarked on yet another DIY adventure, thanks to my frequent “partner in crime,” my friend Karen. For once, it did not involve food–well not technically for consumption at least. 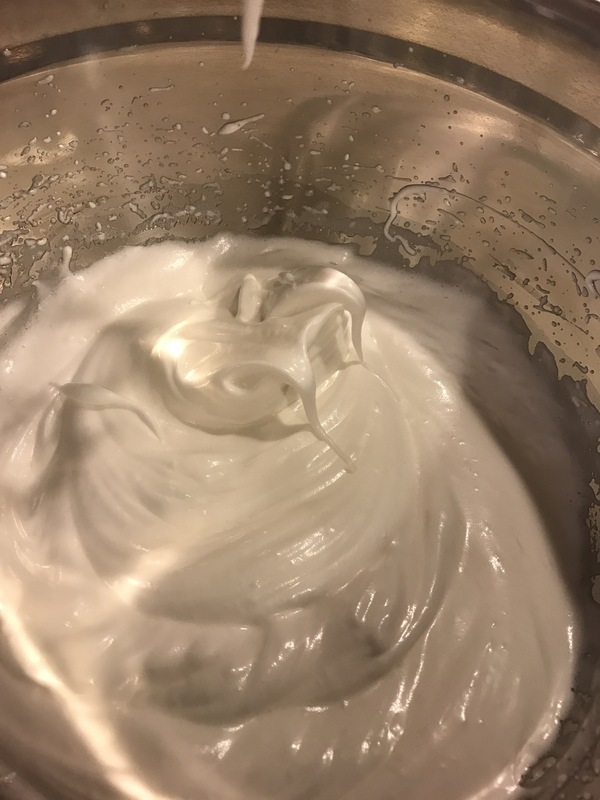 What we began “cooking up” were body butters and scrubs, eye cream, hand soap, body wash, face creams, lip balms and lip scrubs–using natural ingredients like coconut oil, raw honey, green tea, coffee, and even chocolate. It all started out innocently enough, a batch of body butter here, some eye cream there…until we’d amassed (between the two of us) enough ingredients to open up own little shop. I’m not kidding. I maxed out my 25-compartment essential oils box in a matter of 2 weeks (so I bought Karen a 50-compartment box for Christmas). I became so obsessed, I even experimented with making my own deodorant–the jury is still out on that one. 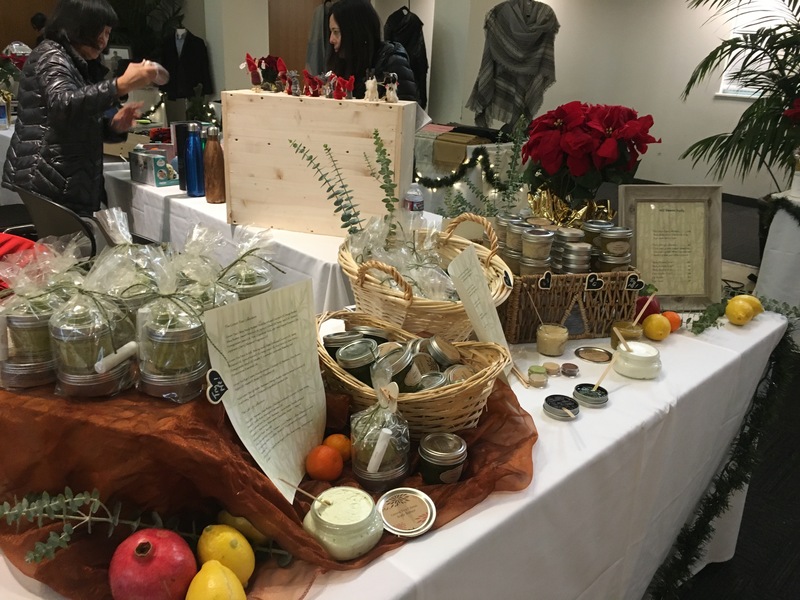 During the holidays, instead of selling baked goods (which would’ve been the obvious choice) I actually sold my food-inspired body products at a charity gift bazaar. Of course, by the new year came a new job and less time to tinker. However, I haven’t lost my enthusiasm for making my own body products. On the contrary, with less free time I’ve had to really focus on making products that fulfill a particular need, like a soothing balm to relieve my congestion when I got hit with an especially nasty, stubborn cold that lasted for weeks…or a therapeutic body body made with Emu oil (who knew?) and other anti-inflamatory essential oils to soothe my aching joints and bruises (hey, nobody said the life of a pastry chef was a cakewalk). 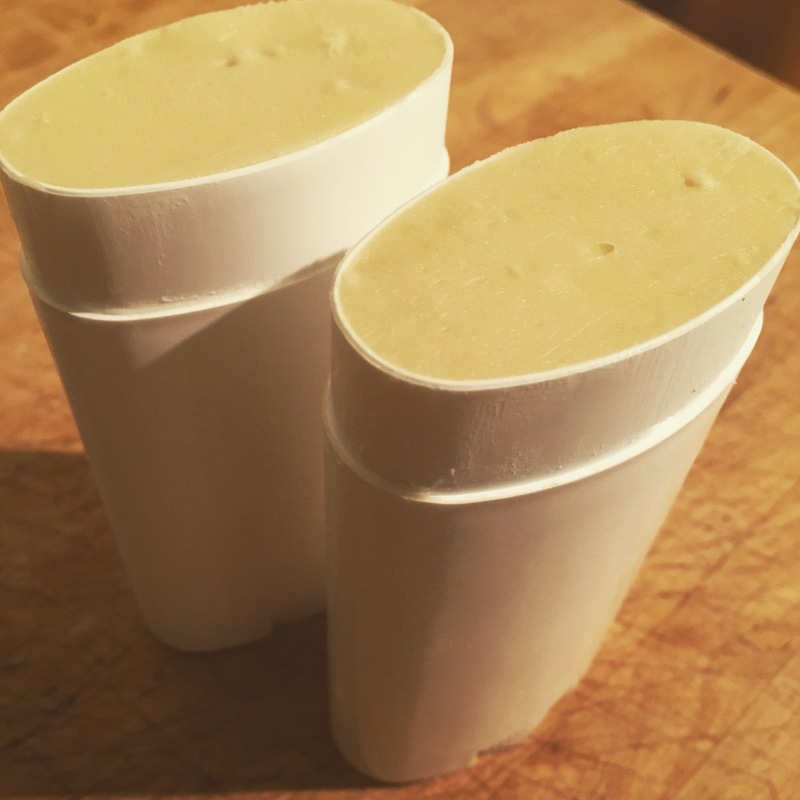 Now one of the easiest and most fun body products to make is lip balm. 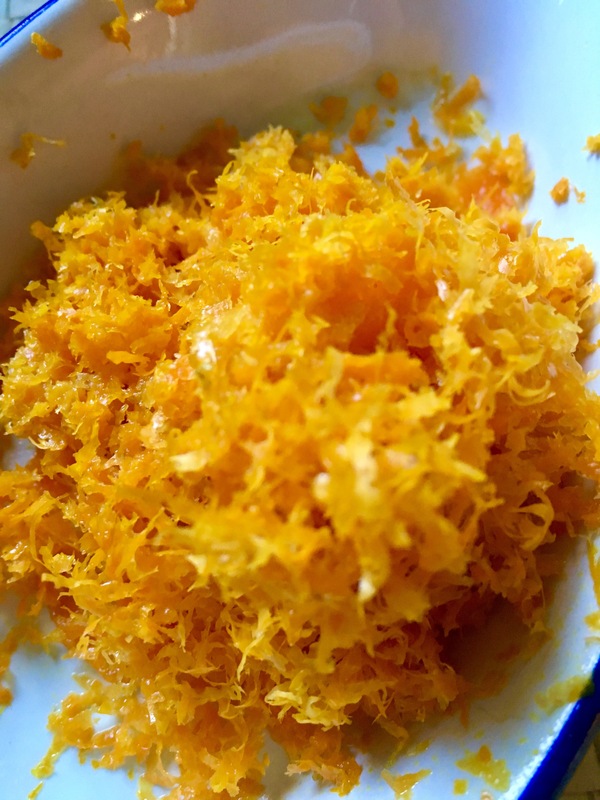 Only a few basic ingredients–beeswax, a little raw honey, and coconut oil, cocoa butter, shea butter or mango butter–and whatever flavor or essential oils (or combination of both) you want to use. You can take it to another level by adding other nutrient-rich oils like vitamin E, argan, pomegranate seed, and sweet almond to the mix. 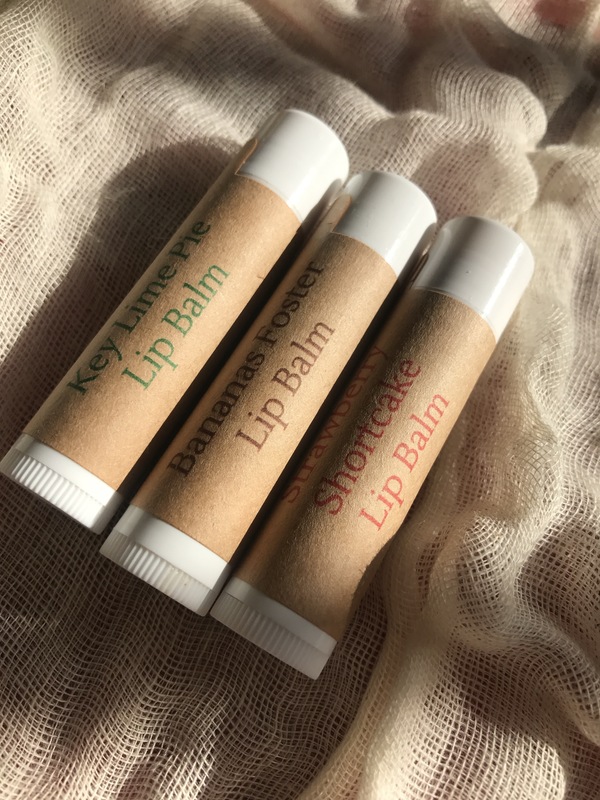 What I love about making lip balms is that you can get really creative with the flavorings and concoct a lip balm that not only moisturizes and keeps your lips healthy, but tastes fabulous. It lets my inner mixologist comes out and play. Lately, I’ve been playing with classic dessert flavors like Bananas Foster, Strawberry Shortcake, and Key Lime Pie, which have been a big hit with my new co-workers. You can fill any small lidded-jars or cosmetic containers with the lip balm mixture but I personally prefer using lip balm tubes. They are a little tricky to fill so I recommend buying a kit that includes a tube holder and scraper, which will make the process so much neater and faster. When Karen and I first started making lip balms, filling those skinny tubes without the holder was so painstakingly slow that we’d have to keep reheating the mix because the beeswax would set up too fast, or we’d overfill and have to clean up the waxy goop that had dripped down the sides of the tubes, otherwise we wouldn’t be able to put on the labels. While I’ve always considered myself a “crafty” person by nature, I never thought I’d embrace the DIY body products with such gusto. Then again, there is something to be said about knowing what you’re using on your body and not paying inflated prices for something you can just as easily make yourself. 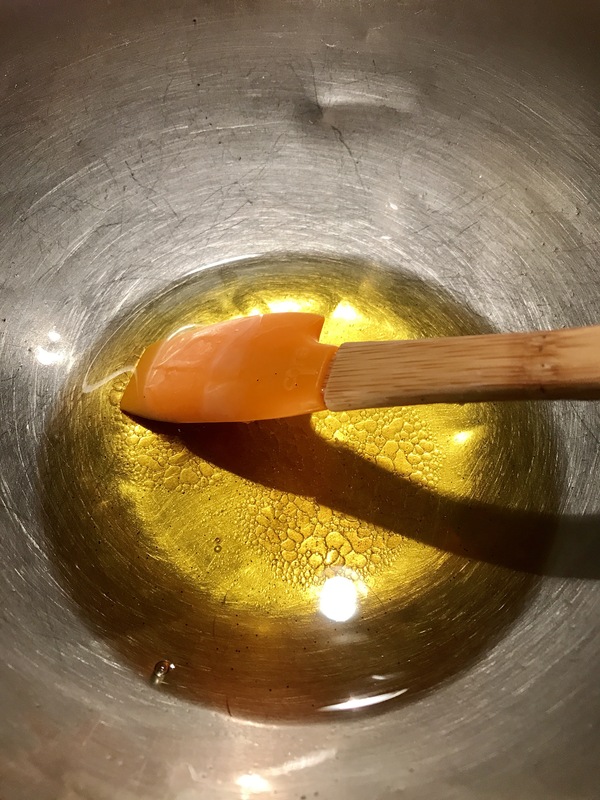 Beeswax will take the longest to melt down, so place it first in a heat proof bowl set over simmering water and melt it down 75% before adding in the coconut oil and/or mango or shea butter. If you’re using cocoa butter, you can melt it together with the beeswax. Once you’ve melted down the solids, you can then stir in the remaining ingredients. Starting a new job 45 miles away from home has presented me with a whole set of challenges these last few months–commuting, then not commuting, living out of a suitcase part-time, not having my familiar home kitchen with all its gadgets, tools and equipment (not to mention fully-stocked pantry), and working longer hours. Finding down time (not to mention the energy) to experiment with new recipes, much less commit anything to writing, has been next to impossible. 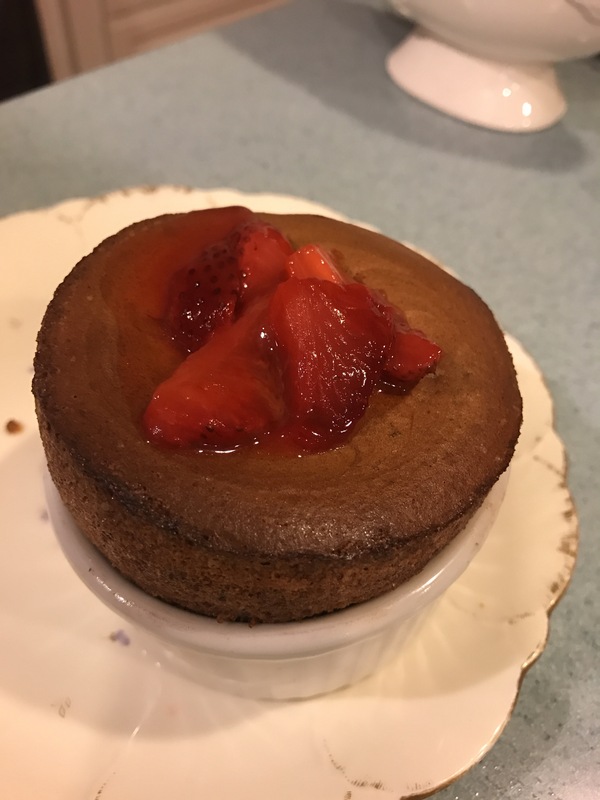 So when my cousin Ed and his wife Har, who have graciously opened their home to me, expressed a desire to learn how to make soufflés I viewed it as a great opportunity to not only repay them for their hospitality, but to document the experience for my blog post. When Ed says he wants to learn how to make soufflés, we’re not talking just one type…oh no. I mean, if you’re going to go through the trouble of making a mess in your kitchen you might as well go big and make 3 types. We settled on the classic Grand Marnier Soufflés, savory Garlic Cheese & Spinach Soufflés, and decadent Chocolate Soufflés. Soufflés sound intimidating, but really aren’t if you follow some basic rules–the first one is to fire up your oven even before you start prepping the components. Adjust the racks so you have one in the center of the oven with a sheet pan preheating at 425ºF. If you’ve got a convection option, set it to 400°F. Next, make sure you’ve got clean, dry soufflé dishes. Brush the insides with melted or softened butter and coat with sugar (for the sweet soufflés) or bread crumbs (for savory). I almost had to resort to using ground potato chips before Ed found panko bread crumbs lurking in the back of the cupboard. The actual process of assembling the soufflés takes very little time so it’s really a matter of getting your ingredients measured out and ready to go. Because we were tackling 3 types of soufflés, it took several hands to prep the various components. I sautéed the spinach, while Ed’s daughter Caroline grated the roasted garlic aged cheddar. Har zested the orange for the Grand Marnier soufflé base as Ed buttered and coated the ramekins. First up were the Grand Marnier Soufflés. This classic was the easiest to make and a good introduction to the process. We made a roux by cooking flour in melted butter, then whisked in whole milk, sugar, salt, and orange zest. It’s important to continue whisking as the mixture comes to a boil to avoid any lumps. 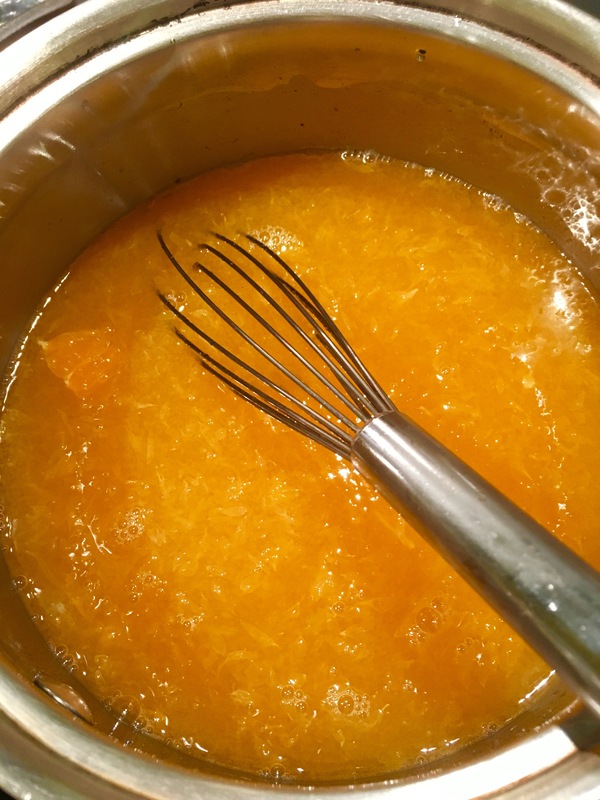 Once we had a smooth, thick paste, we removed it from the heat and gradually tempered some of it into the yolks and Grand Marnier before whisking in the rest of the hot mixture. With the base done, we moved on to the all important egg whites. While you can whip the whites by hand, I say use an electric mixer if you happen to have one, which Har did…tucked inside the recesses of her kitchen–a pristine portable Kitchen Aid mixer that had never been used…until now. I think she was actually excited to finally have an excuse to crack open the box. Once we managed to snap the beaters into place, the real lesson began–how to make the perfect meringue. We started with a clean dry bowl, room temperature egg whites and a little cream of tartar to help stabilize the meringue. We had already used half the sugar in the soufflé base, so before beating the remaining sugar into the whites we first whipped them until they were very white and foamy before gradually beating in the sugar a little at a time. Contrary to what some might think, a stiff meringue does not necessarily produce a light and airy soufflé because it requires more folding to fully incorporate the meringue into the base which can cause the batter to collapse. What we were looking for was a glossy yet still soft texture, what I would called medium peaks. Carefully folding the meringue into the base in three stages, filling the cups halfway and lightly banging the bottoms against the kitchen counter to help the batter settle into cups before filling them all the way, then running our thumbs along the edge to create a little channel were key steps to ensure a spectacular rise for our soufflés…well that and a very hot oven. Given their oven’s quick recovery time, I wasn’t all that concerned about losing too much heat while we loaded in the soufflés, having set the oven at 400ºF convection. However, if your oven isn’t quite that efficient, preheat it to 425°F then turn it down to 400°F once the soufflés are in. After about 12 mins. we were met with these beauties. While the soufflés baked, I sautéed some fresh strawberries in a little butter, sugar, orange juice, a pinch of sea salt, and generous splash of Grand Marnier for a lovely sauce. Emboldened by our brilliant success with the first batch of soufflés, we moved on to the savory ones, which were almost as easy to make. 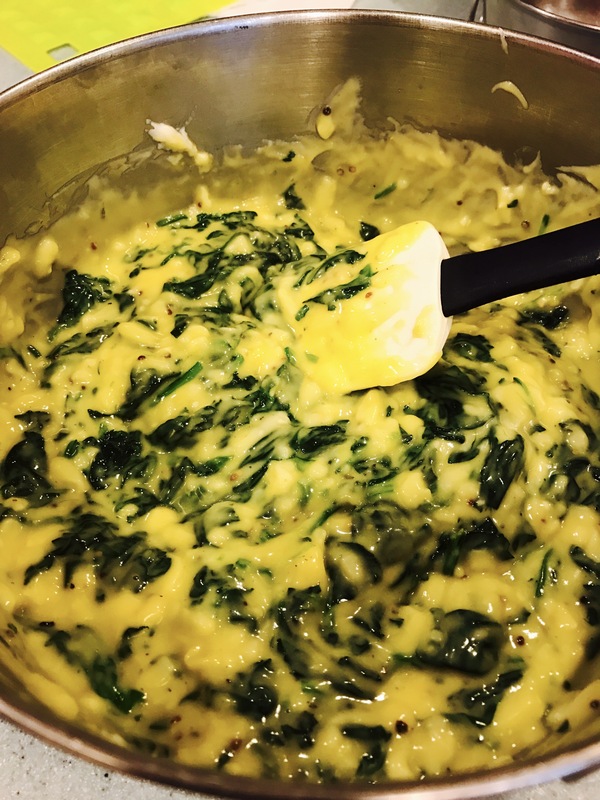 For the Garlic Cheese & Spinach Soufflés, we again made a roux, then tempered in the yolks and stirred in the cooked chopped spinach (be sure to squeeze out as much of the liquid as possible first) and grated cheese. I found a lovely roasted garlic aged cheddar at Sprouts so that’s what we used, along with a little dijon mustard, ground white pepper, dried thyme, and salt. Normally I would add in a pinch of nutmeg and cayenne but we had none on hand. Once again, we whipped our egg whites with some cream of tartar to medium peaks. Because we weren’t beating in any sugar, we took greater care to not over whip the whites, which facilitated the folding process. Caroline took her turn at cleaning the rims of soufflé cups. 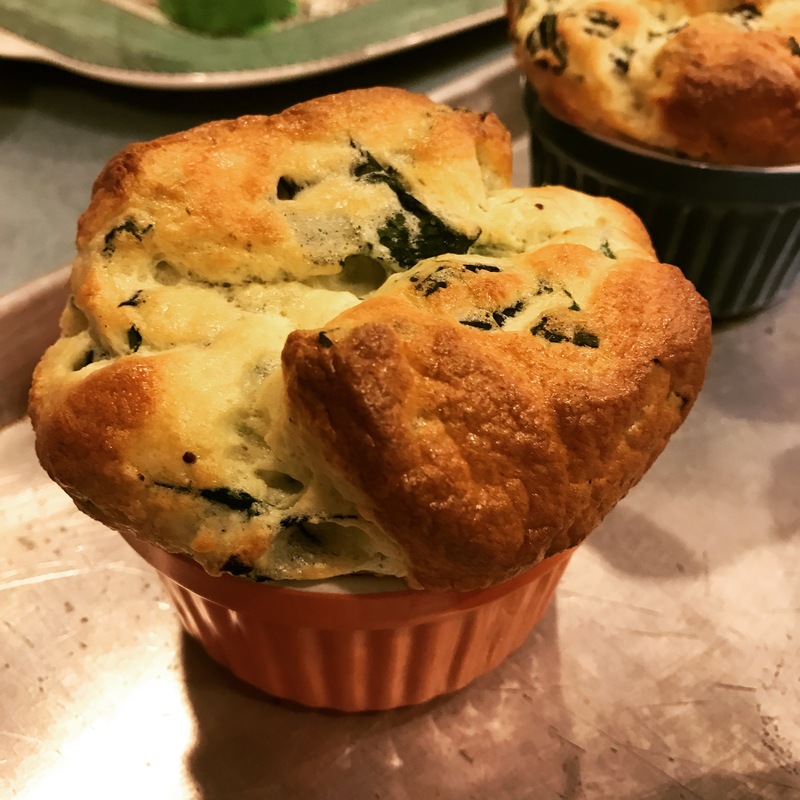 Loaded with spinach and cheese, the savory soufflés took a bit longer to bake, about 18 mins. They rose as beautifully as the Grand Marnier ones and were absolutely delectable. We were feeling pretty full after two rounds of soufflés (well, maybe not Ed), but we soldiered on to make the Chocolate Soufflés. This time I let Caroline and Har have a go at cooking the base, whipping the whites, and folding the batter. For added chocolate flavor, we coated the ramekins in a combination of sugar and cocoa. To finish off the soufflés, we poured the rest of the strawberry sauce in the center of each one. I’m not sure if my cousin and his family will be firing up the oven and electric mixer anytime soon to embark on more soufflé adventures…maybe after Ed buys more soufflé dishes (the ones we had were a little small). But I’ve armed them with the basic knowledge and techniques for soufflé-making…so who knows. In a saucepan on medium heat melt the butter and whisk in the flour. Cook the mixture for about a minute, then gradually whisk in the milk, followed by 1/4 cup of the sugar, salt, and orange zest. Whisking constantly, bring the mixture to a boil. Cook for about a minute. Transfer the mixture into a medium mixing bowl and temper about 1/4 cup into the yolks and Grand Marnier before whisking the yolk mixture into the rest of the roux. In a separate bowl (or stand mixer), beat the whites and cream of tartar until very white and foamy, then gradually beat in the remaining 1/4 cup sugar a little at a time. Whip the whites on medium hight speed to glossy medium peaks. Fold the whites into the base in three stages. Fill the prepared soufflé dishes halfway, then lightly bang the bottoms against a hard surface to knock out some of the air bubbles and help settle the batter into the dishes before filing them the rest of the way. Run your thumb along the rim to clean the edges and create a little channel to help the soufflés rise properly. Place the dishes about 2″ apart on a sheet pan preheated in a 425°F (400°F convection) oven. Adjust the setting to 400°F as needed and bake for about 12-14 mins. depending on the size of the dish. In a saute pan on medium heat melt the butter, add the sugar, and bring to a simmer. Add the strawberries, juice, and salt and cook for another minute until the strawberries are tender. Stir in the liqueur and remove from the heat. Melt the butter in a saucepan and whisk in the flour; cook for about a minute, then whisk in the milk and seasonings. Whisking constantly, cook the mixture until thick and smooth. Remove from the heat and transfer into a medium mixing bowl. Temper a little of the roux into the yolks, then whisk the yolks into the rest of the roux. Stir in the cheese and spinach until fully incorporated. Whip the egg whites and cream of tartar to medium peaks, then carefully fold into the base in three stages. Fill the prepared soufflé dishes halfway, then lightly bang the bottoms against a hard surface to knock out some of the air bubbles and help settle the batter into the dishes before filing them the rest of the way. 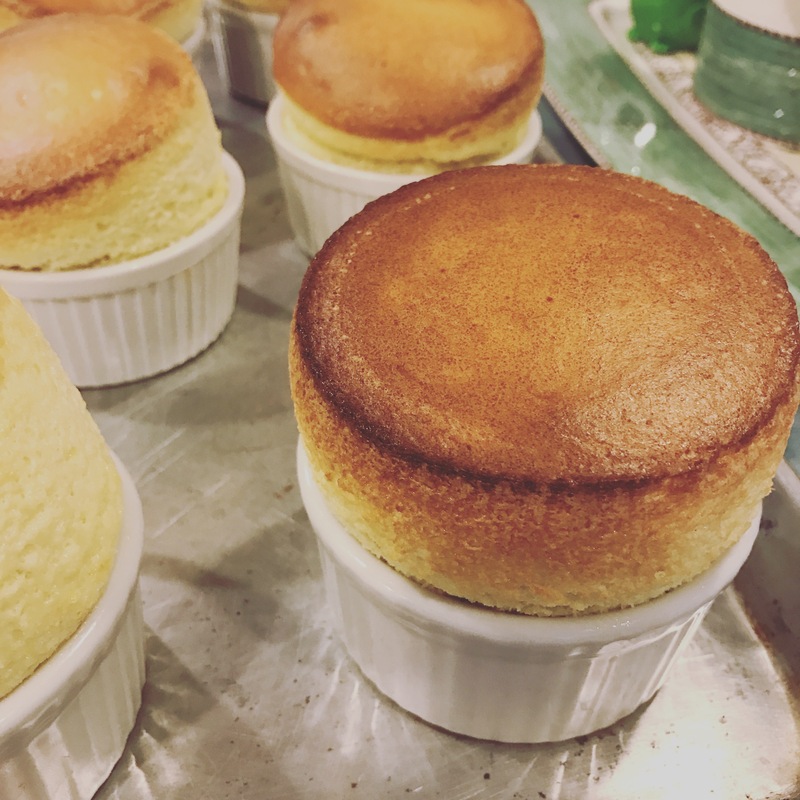 Run your thumb along the rim to clean the edges and create a little channel to help the soufflés rise properly. Place the dishes about 2″ apart on a sheet pan preheated in a 425°F (400°F convection) oven. Adjust the setting to 400°F as needed and bake for about 16-18 mins. depending on the size of the dish. Serve immediately! Whisk together the milk and cornstarch in saucepan until completely smooth. Bring the mixture to a boil on medium heat, whisking constantly until it is very thick and smooth. Whisk in the espresso powder, salt, chocolate, and butter. Whisk in the liqueur. Beat the whites and cream of tartar until very white and foamy. Gradually beat in the sugar a little at a time to glossy medium peaks. Fold the whites into the base in three stages. Fill the prepared soufflé dishes halfway, then lightly bang the bottoms against a hard surface to knock out some of the air bubbles and help settle the batter into the dishes before filing them the rest of the way. Run your thumb along the rim to clean the edges and create a little channel to help the soufflés rise properly. Place the dishes about 2″ apart on a sheet pan preheated in a 425°F (400°F convection) oven. Adjust the setting to 400°F as needed and bake for about 12-14 mins. depending on the size of the dish. Comic: Hey, Girl! 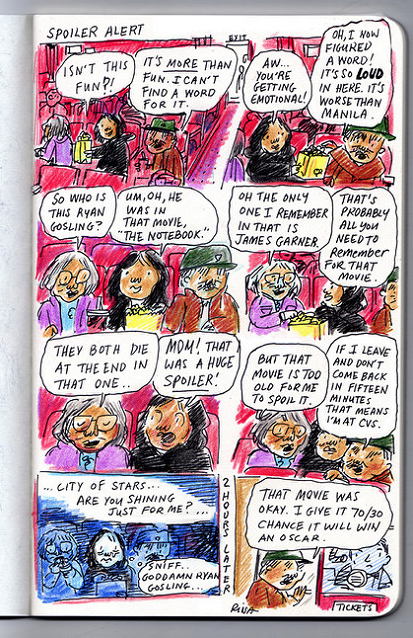 Spoiler Alerts! I’m with a majority of my friends…hell, with the general populous…in feeling that 2016 (for the most part) sucked gigantic donkey balls. The Presidential Election became and continues to be the longest running SNL sketch in American history…though we’re only laughing through our tears. Don’t even get me started on all the amazingly talented, seminal figures we lost, from David Bowie to Prince–Carrie Fisher and Debbie Reynolds in the same week?? Oh come on!! No wonder somebody started a Go Fund Me page to protect Betty White from 2016. Laura probably would’ve done one for Bill Murray or Billy Idol. For me personally, it was an often bumpy road to 2017, full of unexpected twists and turns–leaving a job that no longer gave me joy, in search of other unexplored opportunities with no safety net, then suddenly handed an offer I ultimately couldn’t refuse. A roller coaster ride? You betcha! But I guess you can say I’m a little bit of a thrill seeker, even if the ride sometimes makes me a little nauseous…it’s better than being bored or uninspired. That is not to say there aren’t parts of 2016 I would like to forget (like all the hateful political rhetoric and the outcome of the Presidential Election). Unfortunately, neither I nor others in possession of a reasonably sane intellect can pretend that egomaniacal half-wit who looks like a human Cheeto with a bad combover is even remotely capable of running the country. So the best thing we can do is start over–take what we’ve got and try to turn it into something new, something positive. It’s not about reinventing the wheel, but imagining a better one. Or, how do we take something that is tired or broken and give it new purpose? While society is always looking for the shiny and new, eager to throw away anything that has lost its luster, there is something to be said about creative repurposing. That certainly the case for me when it comes to cooking and baking, whether at home or at work. 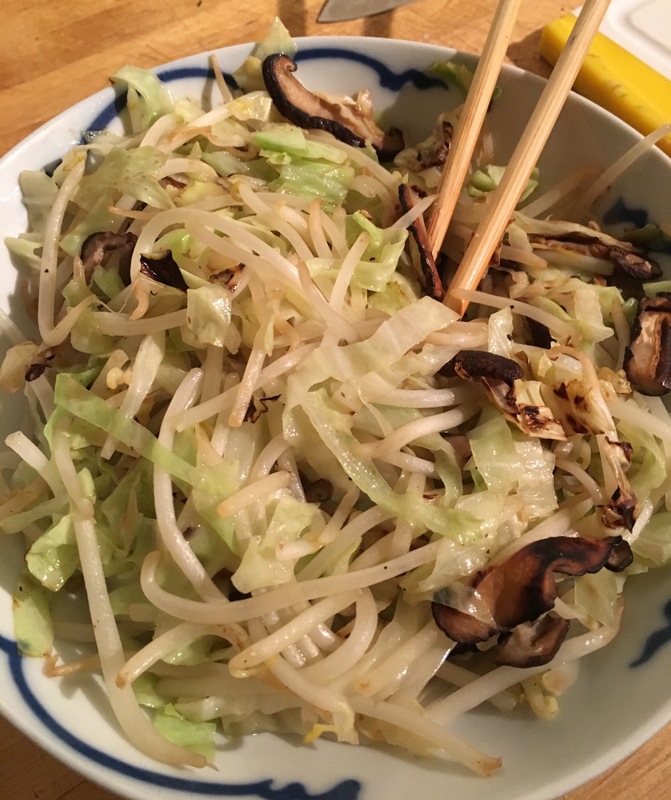 I wouldn’t exactly say that I’m necessarily frugal, but I do hate wasting product, especially when I can be creative and come up with ways to use surplus ingredients. Case in point, I generated copious amounts of egg whites making gallons of chocolate mousse in December. Freezer space was limited so I couldn’t freeze all of the whites to save them for later use. Instead of tossing out the surplus, I decided to make meringue roulades for the New Year’s Eve dessert. Filled with sumptuous cheesecake mousse, brandied cherries and bittersweet chocolate curls they were a delectably sweet elegant way to ring in the New Year. 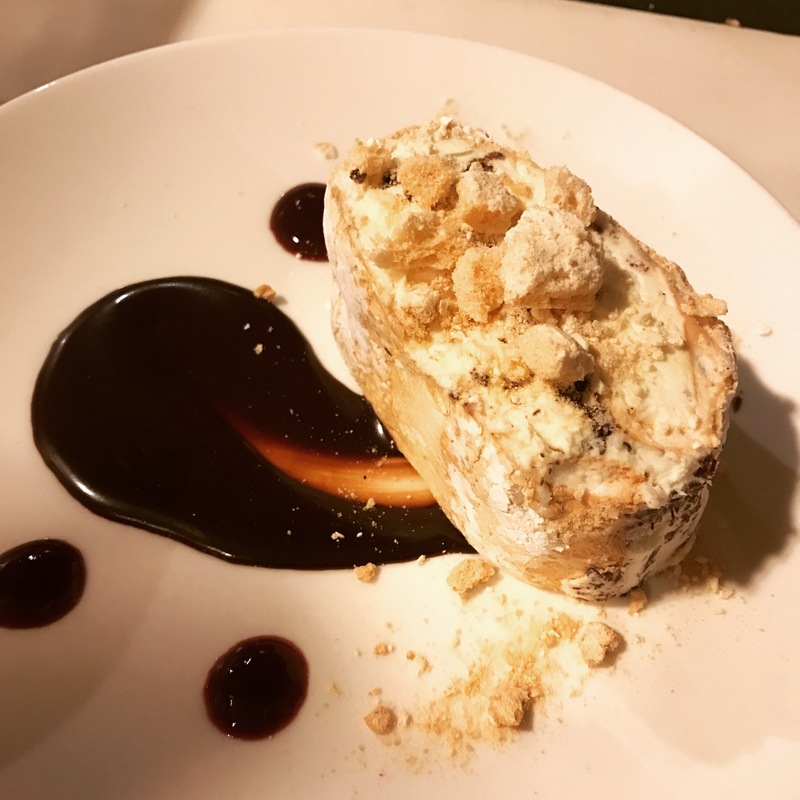 For Christmas, I opted to make two flavors of meringue roulade instead of my traditional Buche de Noel, making use of ingredients I had available in the refrigerator and pantry–a vanilla meringue roulade with white chocolate mousse and (frozen) raspberries and a coffee meringue roulade (flavored with espresso powder) with whiskey-spiked coffee creme, dusted with cocoa. Both were extremely easy to make and well-received. 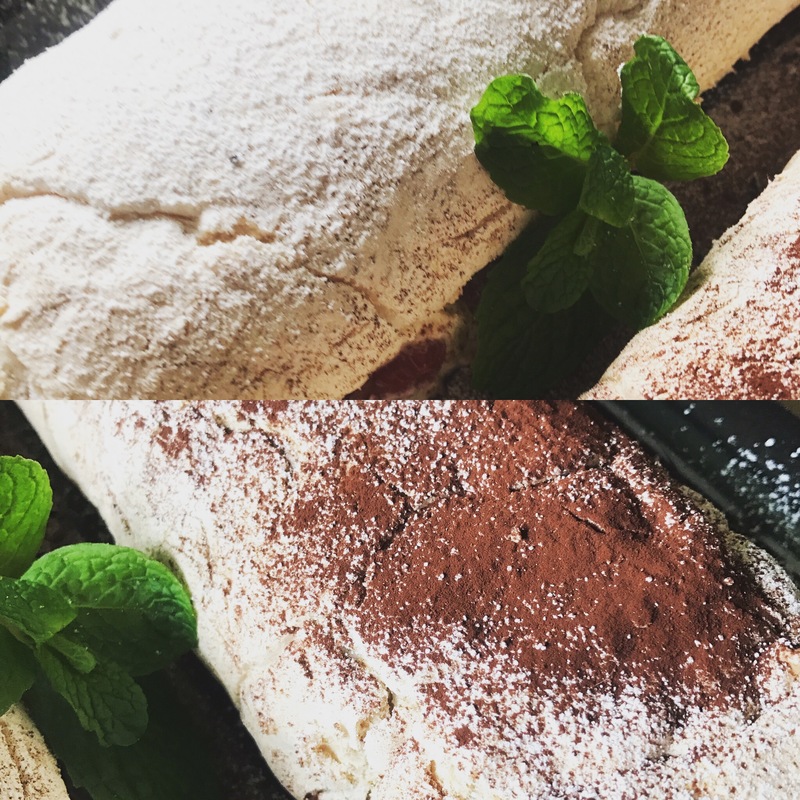 Unlike crispy meringue, which requires low and slow baking and can take twice long as to make, the softer meringue roulade sheets take just about 25 mins. to bake. Once filled the roulades can be frozen until ready to be thawed and served, making it a versatile make ahead dessert. Next time you find yourself with too many egg whites, just roll with it and bake a meringue sheet. 5 large egg whites (5 oz. ), room temp. Preheat the oven to 350°F. Whip the egg whites and salt to soft peaks on high speed, then reduce to medium speed and gradually beat in the sugar a little at a time. Once all the sugar is incorporated, increase to high speed again and whip the whites until stiff and glossy. Beat in the vanilla. *Fold in any additional flavorings. Spread the meringue out evenly onto a lightly greased and parchment-lined half sheet pan. Bake the meringue for about 12 mins. or until lightly golden, then reduce the heat to 325°F and continue baking for another 12-15 mins. or until the surface of the meringue feels firm to the touch but the inside is still pliable. 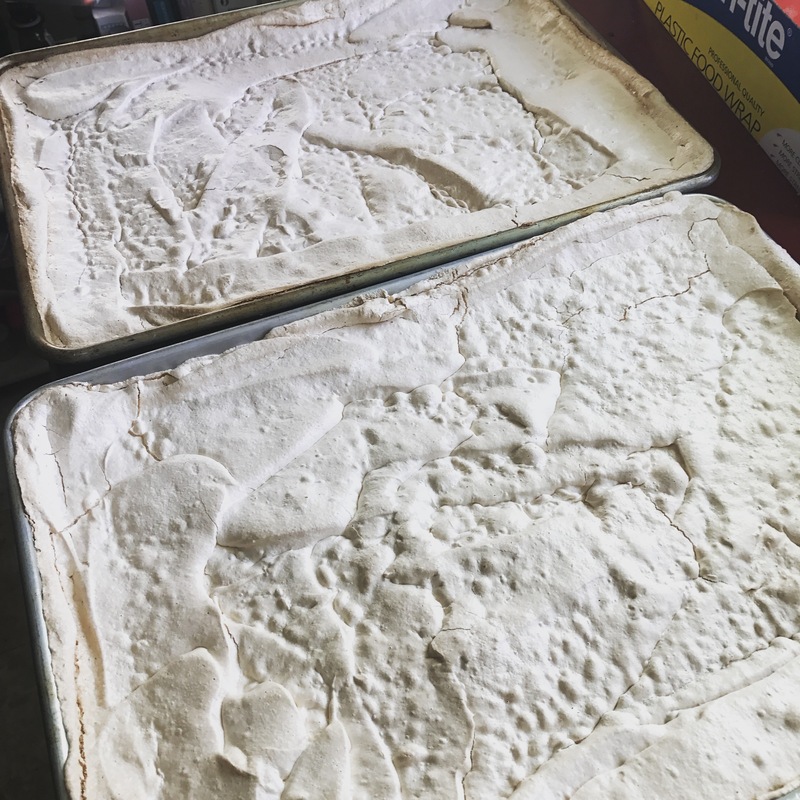 Loosen the edges with the tip of a paring knife, then invert the meringue sheet onto a sheet of parchment paper dusted with powdered sugar and peel off the underlining parchment from the meringue. Drape a clean dishtowel over the meringue and allow it to cool for 10-15 mins. For a simple filling, whip 1 cup heavy cream with 3 Tbsp. powdered sugar and 1 tsp. vanilla extract for medium stiff peaks. Spread a layer of the whipped cream onto the meringue, leaving a 1 inch border all around. Top with fresh or frozen berries and a sprinkling of toasted sliced almonds. Starting with the edge closes to you, gently fold the border over the filling and carefully roll the meringue, lifting the parchment as you roll to help guide the roulade along. Tuck the parchment over and under the roulade and twist the ends to securely seal in the roulade. If you are planning to freeze the roulade, wrap it in an extra layer of foil. Freeze or chill the roulade (seam side down) in the refrigerator for at least 4 hours to firm up. Dust the roulade with more powdered sugar (or cocoa) before serving. 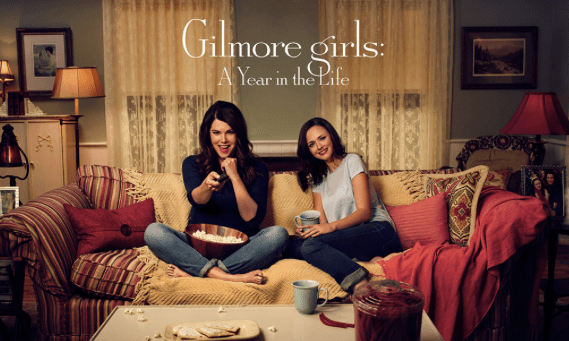 *Warning, if you haven’t watched Gilmore Girls-A Year in the Life, this post contains spoilers! 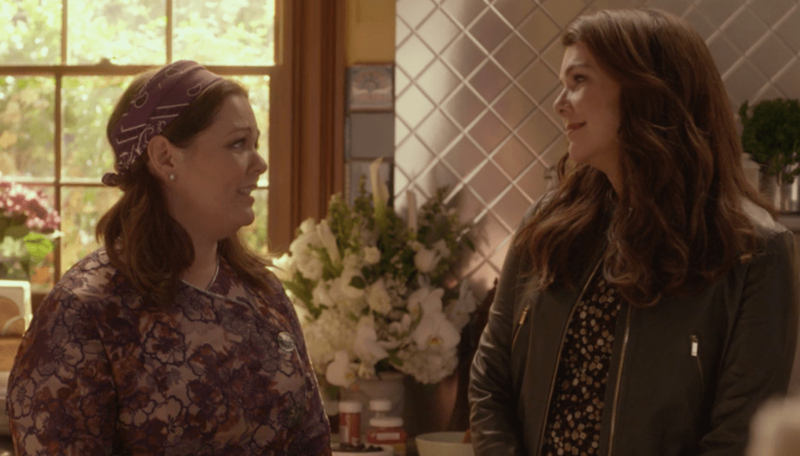 No really…that is how I lost most of last weekend…binge-watching the entire four 90-minute episodes of the new Netflix reboot of Gilmore Girls. My fellow “Movie Chicks” (aka Rina and Laura) and I were, like all Gilmore Girl fans, giddy with anticipation for the premiere of A Year in the Life, gobbling up every morsel of information on social media about possible new storylines, sharing trailers on Facebook, taking Gilmore Girl quizzes. We were primed for the epic reunion/love fest with our favorite characters. Did the Netflix revival live up to our expectations? Meh…not so much. 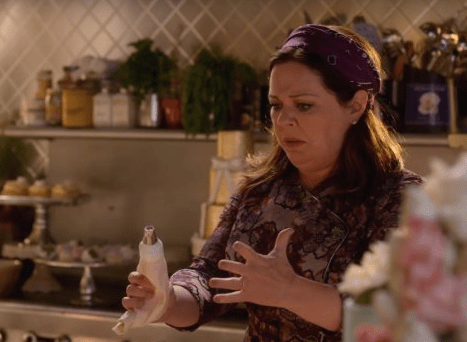 While I am nowhere near as incensed as Rina over some of Rory’s incomprehensibly idiotic life choices…such as her affair with Logan…I am disappointed that my favorite character, Sookie (Melissa McCarthy) made only a brief (though memorable) appearance. I was beyond thrilled when I heard Melissa McCarthy was indeed reprising her role in the eleventh hour. Although I have to admit, if I wasn’t a diehard Sookie fan I would’ve balked at her over-the-top multi wedding cake extravaganza because, let’s face it, I of all people know it’s pure fantasy. No one, not even the amazingly talented uber chef Sookie, could’ve pulled off that many elaborate creations in such a short of time by herself! Do people know how long it takes to wrap a cake in fondant, let alone sculpt one?! We are equally dumfounded and dismayed that Jess (Milo Ventimiglia) didn’t figure more prominently in the storyline, whereas Logan had way too much screen time, when Jess was clearly the more compelling love interest. 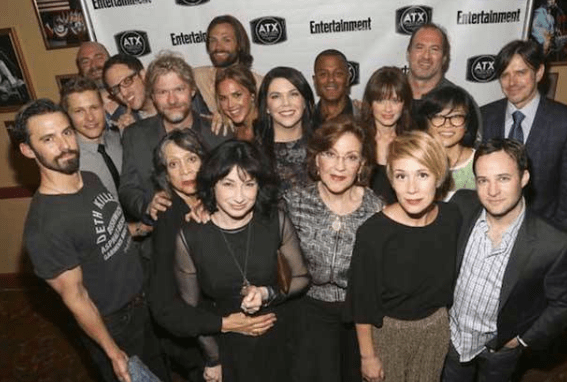 …and “Stars Hollow, The Musical” should be an actual musical. 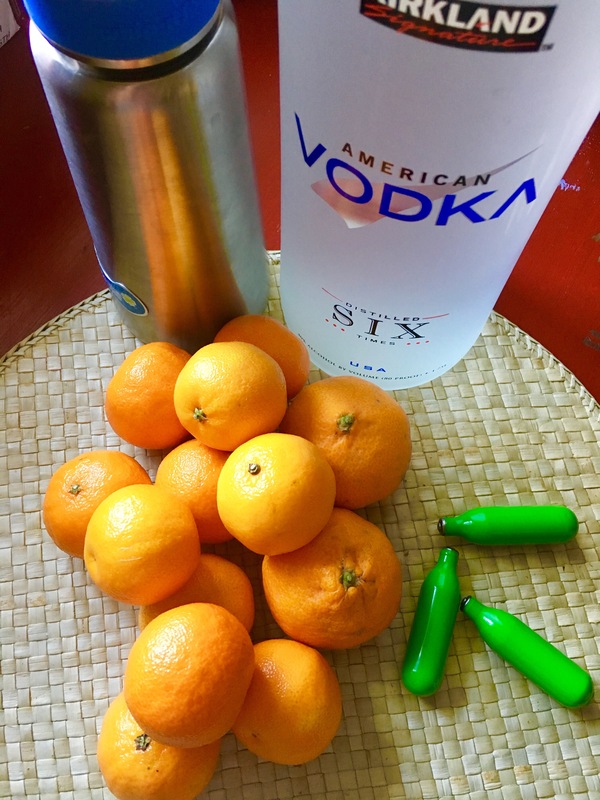 I did, however, manage to make it to the Sunday Farmer’s Market, where I found some lovely tangerines…which I subsequently turned into a fragrant homemade Mandarincello Liqueur. Now had I been sipping this deliciously potent nectar while viewing Gilmore Girls, maybe I would have been less critical of its shortcomings…but then again, I could’ve just woken up with the hangover. 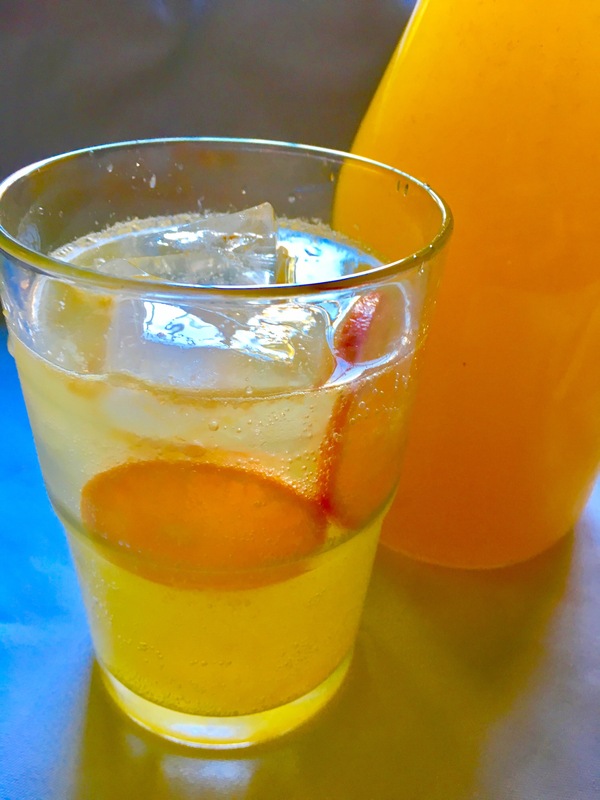 The old school way of making citrus liqueur is to take the peel from the clean, washed fruit (minus the bitter pith), put it in a tight-sealing glass jar, cover the peel in a clear neutral alcohol like vodka (or Everclear), and let the mixture sit undisturbed for about 6 weeks to draw out all the flavor and essential oils from the skin of the fruit. The deeply scented liquor (strained of the peel) is then combined with an equal amount of syrup made from a 50/50 blend of sugar and juice of the fruit that has been brought to a boil. Since I am in possession of a stainless steel whipped cream dispenser (courtesy of Whip It!) I opted for the modern method of rapid infusion through the use of nitrous oxide. which I then placed inside the stainless steel canister along with 2 cups of vodka. I injected two N2O cartridges into the sealed canister and gave it several good shakes. While the N20 worked its magic on the tangerine zest and vodka, I juiced enough tangerines for 1-1/2 cups of juice, which I then combined with an equal amount of sugar and brought to a boil. 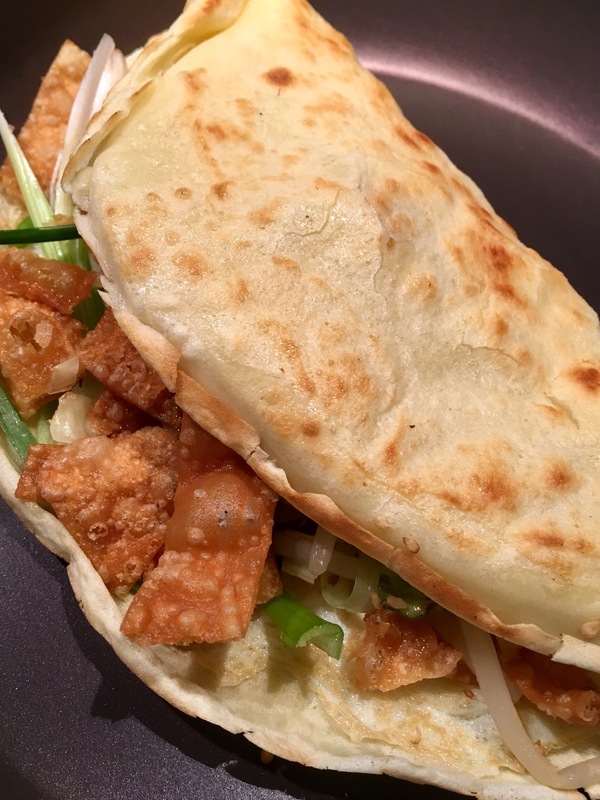 My friend Karen heard about this pop up restaurant in the Inner Sunset generating buzz about town for their “authentic” savory stuffed Chinese crepes. Hungry for a new foodie adventure, we decided to give it a try one morning. Temporarily housed inside a Japanese noodle place, the vendors had set up a large crepe iron out by the front window, surrounded by containers of fresh fixings and squeeze bottles of sauce. It all looked promising. Their offerings were limited to three types of crepe –one of which, the pork (obvious favorite), was already sold out–and a few beverages. A little disappointed, we settled on one of each of the remaining crepes, the “classic” (meatless) variety and the dubious sounding “frankfurter” stuffed crepe, along with a hot sweet soy milk. You know that saying “good things come to those who wait?” This wasn’t one of those times. Our stuffed crepes weren’t necessarily bad, but I can’t say they were worth the almost half hour wait–not when the sum didn’t quite equal the parts. We both liked how they managed to envelop the tender crepe with a thin layer of omelet and how the stack of crushed fried wonton skins gave the stuffed crepes a nice crunch, even if our taste buds were less than impressed by the lackluster vegetables (mainly bean sprouts) and diced hot dogs. As we picked apart the components we couldn’t help but think of other filling combinations that would make a better, more satisfying stuffed crepe. Other than roast pork, our hands down favorite was roast duck. Now to test out our idea, I could’ve just gone to the neighborhood Chinese deli and bought half a roast duck…but I didn’t. No, I decided to roast my own duck…legs that is. I’d butchered a whole duck a while back and only used the duck breasts for my Valentine’s Day An Affair to Remember post. The rest of bird parts were neatly tucked away in ziploc bags in the freezer, which, much to my delight, were still in perfectly good condition. So I took the thawed duck legs and soaked them overnight in a rich marinade of dark and light soy sauce, rice wine, brown sugar, five-spice, dried orange peel, garlic and ginger. 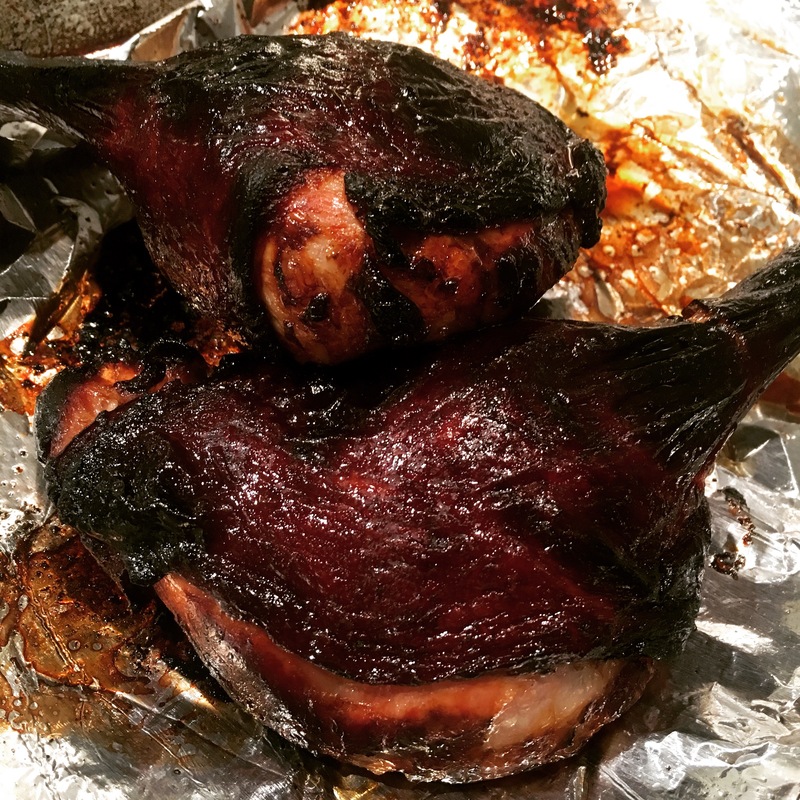 The drained marinated duck legs were then roasted at 425°F for about 25 mins, then at 350°F for another 15-18 mins. until done. 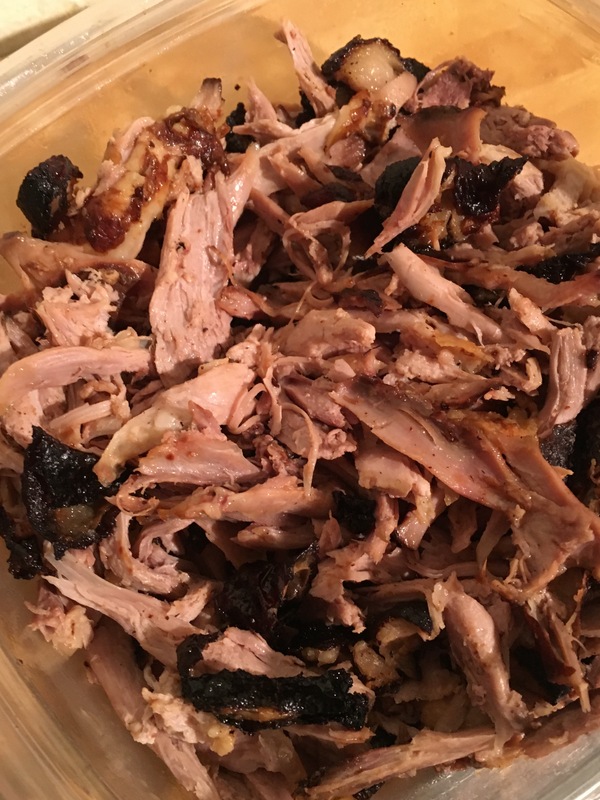 Once the duck legs cooled, I shredded up the meat and chopped up the skin. To start off, you need the crepe. I found a recipe in one of my favorite dim sum cookbooks (Dim Sum by Ellen Leong Blonder) for Chinese pancakes. After my first tester crepe, I thinned out the batter slightly to get a more even, tender crepe. Whisk together the eggs and water, then whisk in the flour, salt, and oil until smooth. Cover with plastic wrap and rest batter for about 20 mins. To make the crepes, heat a 10″ non-stick skillet and swirl in 1/2 tsp. oil. Lift the hot skillet off the heat and pour in about 1/2 cup batter, then tilt and swirl the pan until the batter evenly coats the bottom. Cook the crepe on medium heat for about 30 seconds, until the edges begin to color slightly, then loosen the edges with a spatula and carefully flip the crepe over. Cook the other side for another 20-30 secs. 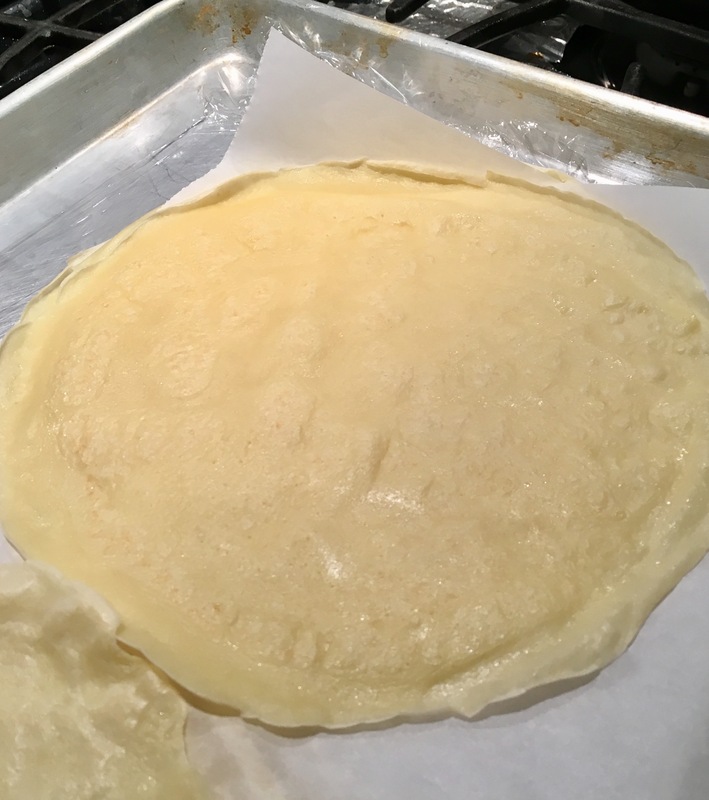 Stack the finished crepes in between sheets of wax paper or parchment until ready to use. 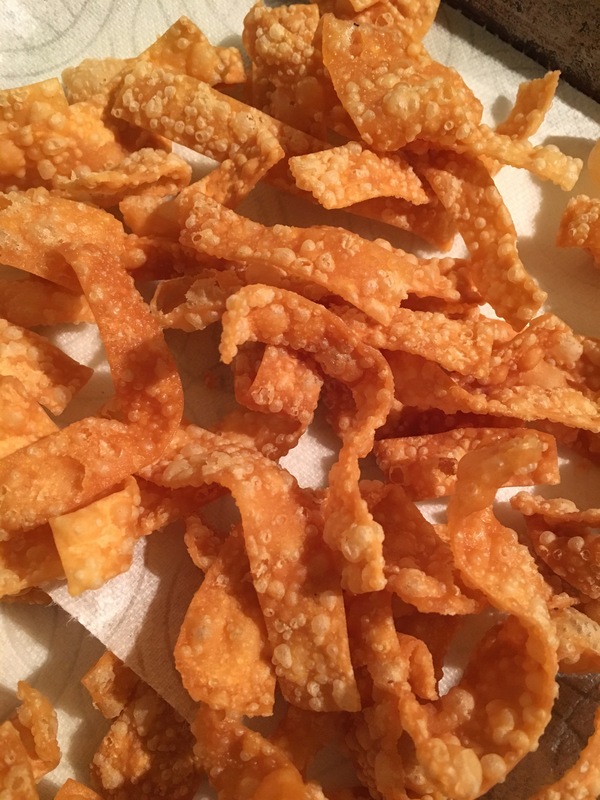 and deep-fried strips of wonton skin for the all important crunch. …then folded the crepe over the everything. 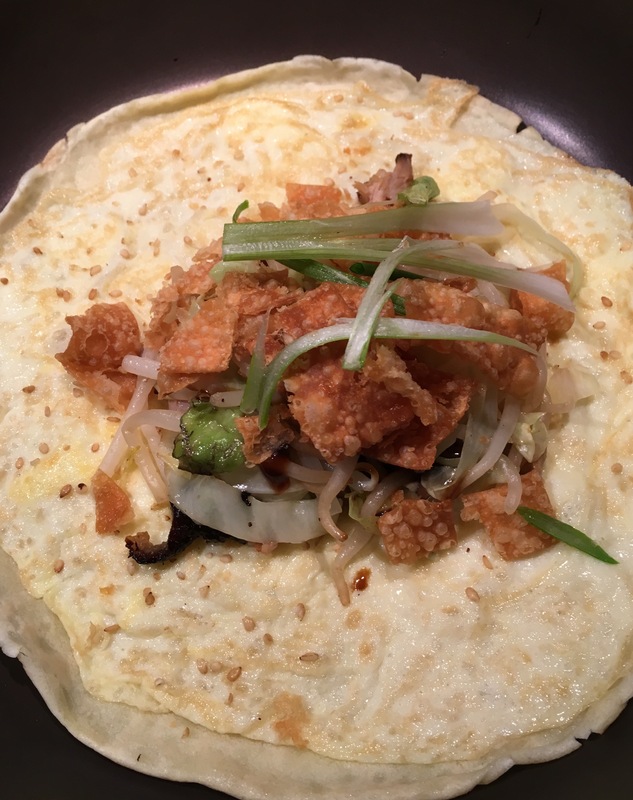 To finish off the crepe, I topped it with a little more shredded duck, vegetables, drizzle of hoisin, fried wonton strips and scallion. 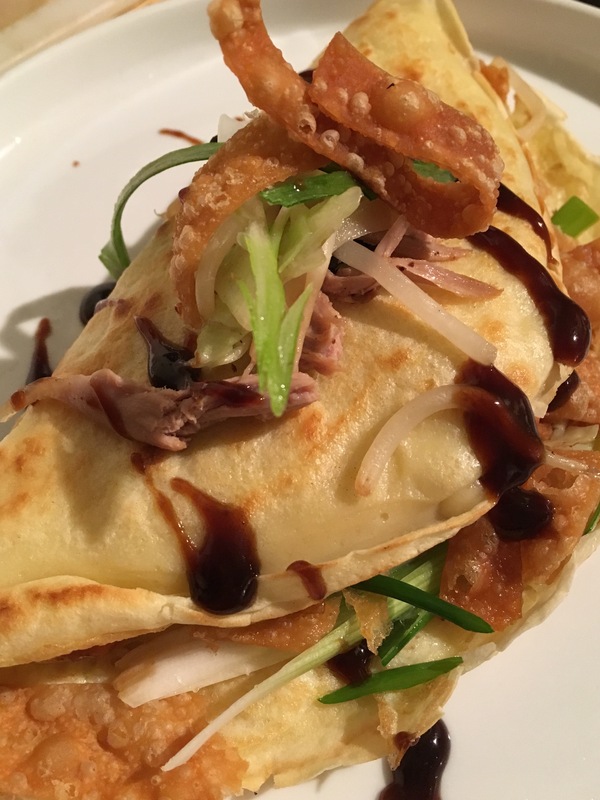 My homemade version of Savory Chinese Duck Stuffed Crepe didn’t exactly look like the savory crepes at the pop up restaurant…but it was definitely worth the effort…and wait.